Hello Cambridge teachers of the World! Today we want to leave the url available online for a booklet containing free sample Reading Tests from the First Certificate Exam (ESOL - Cambridge University). This booklet has been compiled by the Metropolitan College so thank you for sharing it with this community. Hello folks! 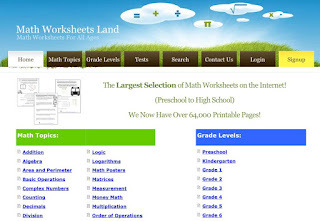 Today we present another subject site with free worksheets. This one has over 5,000 printable worksheets in PDF format. The site was designed as a primary and elementary level free resource. Middle level grade content is being added as well since it is updated monthly. You may find the material classified by grade or topic. Once again, we would like to share a worksheet bank site with free Science printable material for teachers. Today we want to recommend Super Teacher Worksheets, a website full of printable science worksheets for teachers. It includes electricity, animal classifications, animal articles, plants and human body. Surf and enjoy! Hello to all english maths teachers out there. Lisa has been kind enough to send us these practice tests and problem banks. These are all sample pdf files so some of them may require previous registry. Print them and use them with total freedom. Enjoy!